This morning we gathered ourselves and Brad went on the roof to strap down the slide topper since we couldn't find anyone to fix it on a Saturday and even those willing didn't have access to the parts. We then took Deuce (New Jeep for those who missed the news) to Jiffy Lube and had all fluids flushed and or drained and replaced. Back to Paradise Casino for what we hoped would be breakfast but no luck - ends at 10:30am. so lunch it was. Then we headed off to Quartzsite. I drove the RV and Brad drove the Jeep. We decided not to tow it until we have the insurance in place. So many things can go wrong when you're towing. Driving back we had to go through a Border Patrol along Hwy 95..... When pulling up I was unclear if I should pull over the last 'bump in the road or stay outside of it. The guy was guiding me up with his hands and then gave me a thumbs up. Now, in my blondeness I took that to mean I was good in the spot I was in. Threw it in Park and shut it off. Reasonable, right? What I didn't know- because the A/C was on and the dog was doing his usual car routine- was that the guy said I was good to go. I figured he was going to enter the RV and look around, Nope. Because of the confusion this thumbs up caused, he came to the window and asked if I speak English... yes, of course. Brad is behind me in the Jeep knowing full well that I was in one of (what he calls) my 'dark hole' moments. A blonde moment most people call it. I've been telling him I can't cope with this heat... he's not hearing me. Anyway, we arrived back in Quartzsite and decided to try the La Posa South LTVA (Long-term Visitor Area) since the West hadn't been very social. When driving in I realized Brad had been stopped. Oh yeah, he doesn't have a sticker on the new Jeep. Anyway, he had to go back to the West LTVA to get the sticker so while he was doing that, I went to dump the tanks and reload the fresh water tank. Enroute to that I saw a spot that would be good and went back to it when I was finished, just as Brad was pulling up. We left the RV at the spot and drove around the LTVA land looking for something else. 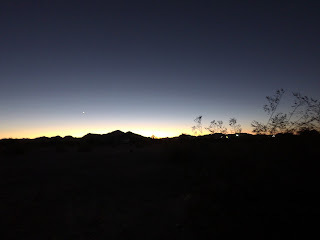 Not because of a problem, it's just what we had planned in Yuma this morning. Didn't find anything else and so moved the rig into position and went to Quartzsite looking for a seat belt latch for Robbie that I had seen at one of the tents. Closed, just my luck. We will try again in the morning, at least we know where to look. Went to Silly Al's for supper and then back to the rig where we promptly set about setting up camp. We are now sitting outside, the sun has just gone down and we are enjoying an hour of quiet computer time. We have chosen this spot as a permanent spot with the understanding that if we should decide to go somewhere else once the topper is fixed, we will. Here are some pics of the broken topper. Nice that you are back ion Quartzsite again , enjoy your time there. Not everyone in the desert is sociable especially at this time of year. Out of state license tags tend to be somewhat friendlier, We met the most new people in La posa west our first year there in jan 2007. Good to know. We have found BC plates tend to be the least friendly. Surprisingly. We'll see how it goes. You will need to add to the Jeep for towing is a Braking System that activates the Jeeps own Brakes as needed when being towed. Otherwise it could cause problems and extra wear on the Motorhome's own brakes. Been through that Checkpoint quite a few times. We're familiar with the brake system issue and we found out that it is not a requirement so we're going to wait as there have been a lot of expenses lately. Obviously we will need one before too long. Found your blog recently while checking out who Al reads. We've also got an ACE (2015 30.1) and are very happy with it. But we're not full-timing, so it gets used differently. Hope you're finding it to be adequate enough. Just a word about braking systems, especially if you're coming to California. Anything weighing over 1500# must have an independent braking system. We tow a little Fiat 500c and it barely weighs 2000#, but we've got a system on it. It was explained to me that if we're in an accident, even if we're not at fault, if we got "caught" without a braking system we could be liable. I'm sure you're doing your homework, but just know that almost all states have a law requiring braking systems on towables. Enjoy your Jeep. Looks like a lot of fun! Thanks for that input Laura. We love the Ace so far. I was confused on the brake thing because I thought it was law but here I was told no. Must be an AZ thing. Makes much more sense now so thank you very much and we hope you enjoy following along. Al rocks! !